It’s fair to say that Neck Deep’s rise to pop-punk stardom was pretty meteoric, releasing two EP’s that were well received and then signing to Hopeless Records (home of Yellowcard and The Wonder Years) solely on the back of those two releases. Debut album Wishful Thinking comes around 15 months after their debut EP Rain In July and will probably continue the Wrexham bands ascent both in the UK and overseas, regardless of whether it deserves to or not. Pop-punk is a genre that seems incredibly easy to get right, and Neck Deep fall within the group of bands that play it in a way that’s guaranteed to please fans without necessarily pushing boundaries. If anything, this is the main criticism when it comes to Wishful Thinking – it’s nothing you haven’t heard before. If you’re a fan of the genres more generic bands then Neck Deep’s debut will probably sit quite well with you, but if you prefer a take on the genre that’s a bit more adventurous then Wishful Thinking is not the album you’re looking for, and never will be. ‘Losing Teeth’ kicks things off in distinctly average fashion, with lead vocalist Ben Barlow all over the place amidst gang vocals and standard surging instrumental backing. For a song about growing up with friends it seems to lack a lot of heart, and covers a topic that’s been covered a thousand times by a thousand similar sounds. Following tracks ‘Crushing Grief (No Remedy)’ and ‘Staircase Wit’ are refreshingly better, dropping clichés in favour of memorable lines and instrumentals, especially with the guitar work on the latter. Tracks like these show flickers of how good Neck Deep have the potential to be, but the nine songs that follow struggle to come close, especially ‘Growing Pains’, which is painfully forgettable. Throw in the fact that a lot of Wishful Thinking sounds very similar and you end up with an album that falls short and often borders on boring. 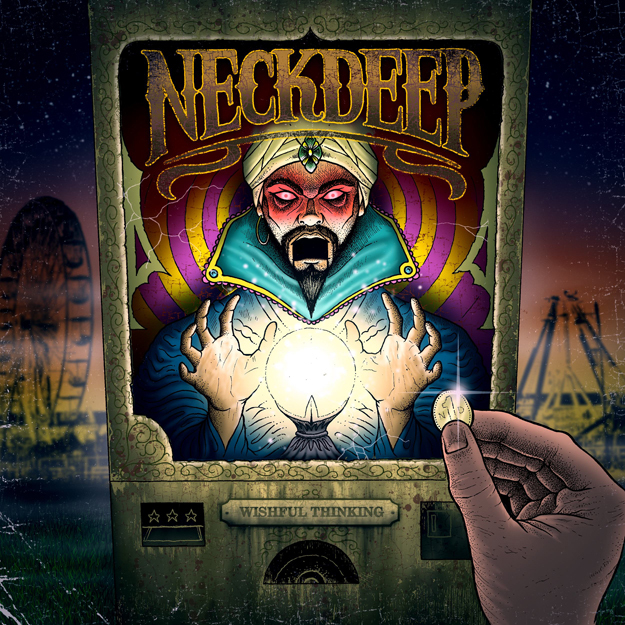 For the most part, Neck Deep’s debut sounds generic and recycled, which is a huge shame. Barlow’s vocals are subpar and nowhere near the standard of the bands earlier work whilst the instrumentals are good, but aren’t as dynamic are explosive as they perhaps should be, especially the drumming. By no means is Wishful Thinking a strikingly poor album, but it’s all too familiar in the worst possible way. It’s clear that Neck Deep have matured on Wishful Thinking, but in doing so have lost a lot of what made them so appealing initially. The bite and emotion that their earlier work carried has been dialled down, and it’s evident on the re-worked version of ‘What Did You Expect?, which is half the song it used to be. Neck Deep have also adopted a much more positive frame of mind on their debut, and although it suits their style the attempts to move forward seem like a step back, because the passion that burned throughout their preceding EP’s has been reduced to a dull flame. The heavier ending to eleventh track ‘Blank Pages’ feels forced, ninth track ‘Sweet Nothings’ delivers pretty much what its name promises, and the key change in ‘Zoltar Speaks’ is laughably bad. However, the emphatic ‘Damsel In Distress’ is one of the albums redeeming features alongside emotional closer ‘Candour’ which features Laura Whiteside, who past collaborated on ‘A Part Of Me’. ‘Candour’ is the best Wishful Thinking seemingly has to offer, because it’s one of the few tracks to expose itself to an audience. It’s much more intimate, as opposed to the repetitious feel-good anthems that populate the majority of the twelve tracks found here. It may not be the rousing finale it aims to be, but it’s a fitting closer that adds something new after eleven tracks of the same tired formula. There’s a part of me (no pun intended) that likes Wishful Thinking, but there’s also a part of me (still no pun intended) that knows I should like it a hell of a lot more. I was disappointed after my first listen, and felt the same after my tenth before I sat down to write this. That being said, these are only my opinions and there’s a good chance you’ll feel differently about Neck Deep’s debut full length than I do. For that reason alone I’d recommend you listen to it; maybe it’ll surprise you. However, that may just be wishful thinking (pun intended). Thanks a lot man, glad you liked what you found.